As one of the most popular brands of mobile phones on the market, Sony Ericsson has become a household name. People love them because of the high degree of customization available and they are also rather cheap compared to other producers of mobile phones. If you currently own a Sony Ericsson mobile phone, then the Sony Ericsson Update Service enables you to install software updates and interact with the content made available for free by SE. It will update your phone to the latest version available. Version 2.10.136 is a freeware program which does not have restrictions and it's free so it doesn't cost anything. For security reasons, you should also check out the Sony Ericsson Update Service download at LO4D.com which includes virus and malware tests. Additional screenshots of this application download may be available, too. Sony Ericsson Update Service has a presence on social networks. 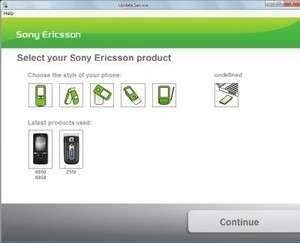 Sony Ericsson Update Service download been highly rated by our users.